Talismanic forward and Invicta Dynamos third highest all time points’ scorer Callum Fowler is returning to the club for an eighth season looking to add to the 569 points he has already tallied at the SilverBlades Gillingham in 245 games. At the age of just 25, forward Callum Fowler is already a huge figure in Dynamos history having brought skill, assists and goals in abundance since first icing for the club as an 18 year old in 2010. After arriving as a hot prospect from the Peterborough Phantoms, then of the EPL, the forward spent five consecutive terms leading the line in Gillingham during which he scooped Player of the Year and Supporters’ Player of the Year accolades as well as being voted the prohockeynews.com NIHL South Division 1 Player of the Year by his opponents. 468 points in 181 games for the Dynamos and an NIHL Southern Cup win naturally drew the attention of the EPL and, in 2015/16, the Bracknell Bees secured Callum Fowler’s services taking him to nearby Berkshire. However, despite making an impact with the Bees, the skater’s stint at his new side was cut short as the club suffered financial turmoil and Fowler made his way back to Kent for the second half of the season. On his return to the SilverBlades the prolific forward managed 48 points to break the 500 barrier in a Mos jersey and help guide the team to a runners-up position in the NIHL South Division 1. In 2016/17 Callum Fowler once again laced up his skates for the Dynamos and was this time given the responsibility of captain as the club chased a 19th honour in the organisation’s 20th season. 24 goals and 29 assists saw the team’s number 91 notch another 53 points – including the last of the season as he fired home in Chelmsford against the Chieftains to help the Mos claim the NIHL Southern Playoff title. Now, some seven years after his first senior appearance for the club, Fowler has committed for an eighth season in Gillingham where a tally of 37 points or more would see him overtake fellow club legend Elliott Andrews to become the Dynamos’ second highest all time points’ scorer. Speaking on the return of Callum Fowler, Head Coach Kevin Parrish said, “Callum is one of the most naturally gifted players in this league and with the level of competition increasing significantly this year I’m delighted he has agreed to sign on again as we compete in British ice hockey’s second tier. His return of 569 points in 245 games tells you everything you need to know about his on-ice influence with his flair and creativity a vital asset in unlock opposition defences. His determination when he gets the game between his teeth and passion for his hometown club are just as important. I look forward to working with him again in 2017/18 as he attempts to become only the third player in Mos history to surpass the 600 point mark”. 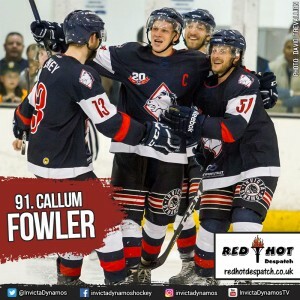 Forward Callum Fowler will once again wear the number 91 jersey he has made his own in Kent and his acquisition takes the team’s roster to 17 as they prepare to start the campaign next weekend on the road against the Basingstoke Bison on Saturday before facing the Milton Keynes Thunder at home on Sunday. Warm-up Jersey – For just £125 get your name or logo printed on the back of Callum Fowler’s warm-up jersey. Sponsors are also named on our website and in our match day programme and then presented with the jersey to keep at the end of the season. Game jerseys – For just £150 get your name or logo printed on the back of Callum Fowler’ home or away game jersey. Want both? For just £250 for individuals / £300 for businesses get your name or logo on the back of each of Callum Fowler’ game jerseys. Sponsors are also named on our website and in our match day programme, are announced over the loudspeaker during player introductions at every home game, receive a programme advert (business sponsors only) and are presented with their jersey (one shirt) at the end of the season.